Just back from a crazy trip to Austin, TX for SXSWedu. I admit I was beyond excited to get a chance to go to the legendary conference. One major point was that comparing reading on a device to print is like comparing apples and oranges. It is not the same type of reading, usually. Device reading is often for a completely different type of content. Point two: it is crucial that we teach students how to read on a device. The skills of digital reading need to be taught. Point three: digital text offers advantages including immediate feedback. For someone who builds digital materials, it’s important to note that we need to use digital text to enhance the reading experience. Things like customizable fonts/sizes, audio narration, highlighting, taking notes – all these things are important. The founder of Curriculet was part of the session. It was very interesting to hear why he founded the company in response to what he saw as a lack of good digital content when he was a teacher/principal. Went to a fun playground booth by National Geographic. 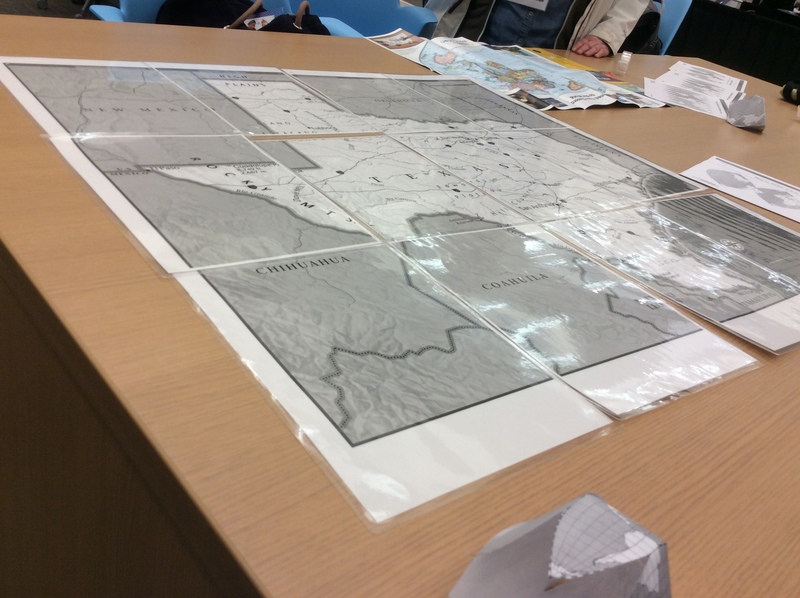 Great activities and demos about using geographical concepts with kids. What can I say about Kahoot besides that I love it? They are coming out with some new features in the next few months that will make it even more useful for my needs. Student data and data privacy were big buzz topics at this conference. I should have attended more sessions about this. I need to do more on this topic. Hoping there is some of this conversation at ISTE as well. The last day was 4 keynotes. The first was the director of the Grammy Museum talking about the importance of music education. I agreed. Sal Khan spoke. I have never heard him speak at a conference, and he was awesome. He’s very funny, a great speaker, and has a great story to tell. I knew lots about Khan Academy, but it was great to hear from him about their recent things and plans for the future. However, the best part was the tech fail. He was showing a video about a kid who used Khan Academy to not only catch up in high school but get ahead. The kid just accepted a full time job at Khan Academy (he has gradated from college now…) The video didn’t work. The audio did, but not the video. The tech guys tried three times, nothing. Sal just gracefully plugged through and kept going. Fortunately, the audio was the most important part, but the lesson here was watching him deal with the potential melt down of his talk. He rolled with it and was inflappable. I will remember that for the next time my tech fails — fortunately, it will not be in front of hundreds of people! This was only the 5th SXSWedu, building off a very successful brand for the Music and Film events. I believe I heard there were 8,000 people for the EDU event. After ISTE with 15,000+ people, this one felt small – but that’s not a bad thing. I was able to get in to sessions with no problem and the venue was easily accessible without being overwhelming. Attendees were an interesting mix of some teachers, more administrators and lots of edtech company folks. Sessions were a mixed bag, but that could be because of the sessions I chose. I naturally gravitate to the technology sessions, but with one exception (the digital reading one), there was nothing new or even that interesting. I started attending sessions that were far more out of my normal subjects (such as the student data session), and that was better. Still, the sessions I attended were not all that inspiring. As I’m learning, the best experiences come in more direct connections. The most valuable conversations happened in the Playground, where a handful of vendors were set up. It wasn’t an Exhibit Hall (which was oddly open only during one afternoon???) although it was people with commercial products. It felt more like a demonstration area. There was a space for short talks and another for hands-on interactive experiences. This was where the folks from Kahoot and National Geographic were located. Overall, I think SXSWedu has great potential, but at this point, it feels a little unfocused and it needs to find its stride.Not being quite as teacher centered at ISTE, the conversations were bigger and more theoretical. Unlike ISTE, SXSWedu has potential to have a bigger museum presence. We felt that conversations about informal learning and how museums are a great partner option would be welcome here. Next year we’ll propose a session! I’m currently at a conference, although not really. My daughter is singing in a national honor choir (congrats!) and I’m here as her “chaperone.” Basically, it means I have a ton of freetime while she is in rehearsal! I’ve seen Chris present number of times at education technology conferences, but really enjoyed seeing a presentation in a music conference setting. Many different kinds of jokes from this perspective! It’s pretty clear that choir classrooms are not the first to jump on the technology bandwagon (except for Chris!) He did a great job setting up why it’s crucial to be using technology. He points out (very accurately) that the kids are using technology in your class already, whether you like it or know it. I especially appreciated two thoughts. One was a phrase I haven’t heard before — but just loved and will use (with credit, of course!) The concept of technology integration vs. outtegration. He feels that most of the tech use in music/choir classes has been outegration — a recording made outside of class, or listening outside of class. Instead, the use needs to be in class. Second, was attributed to someone I neglected to note – but the quote was, “Are you here to learn or are you here to change?” This is a great way to think about technology in classrooms. We should never be using tech in a classroom just for learning the same way we always have. Does the choir classroom look the same way it did 50 years ago? Instead, technology allows us to change the way the classroom looks and the way the learning happens. The rest of the session covered 9 excellent strategies for stepping in to the shallow end of the SAMR model: substitution and augmentation. This is a great way to approach a group of people who aren’t comfortable with tech. There were definitely a few of those people sitting by me. The audience asked some great questions. It seemed to me that it was a group of folks hungry for information about this topic. It is definitely scary to some, but this wasn’t a group that seemed resistant – quite the opposite. It was clear that some of them were familiar with the concepts, had used some of the tools. They were there because they were excited by the possibilities and wanted to learn more. I left feeling very positive about the direction this is going. I think there will be many more opportunities for Chris to share his knowledge with this group!